The robots.txt file is one of the primary ways of telling a search engine where it can and can’t go on your website. All major search engines support the basic functionality it offers. There are some extra rules that are used by a few search engines which can be useful too. This guide covers all the uses of robots.txt for your website. 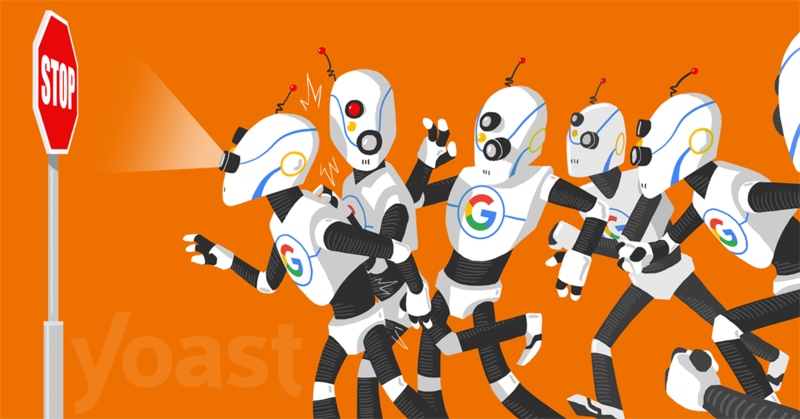 While it looks deceivingly simple, making a mistake in your robots.txt can seriously harm you site, so make sure to read and understand this. What does the robots.txt file do? A couple of developers sat down and realized that they were, in fact, not robots. They were (and are) humans. So they created the humans.txt standard as a way of highlighting which people work on a site, amongst other things. A robots.txt file is a text file, following a strict syntax. It’s going to be read by search engine spiders. These spiders are also called robots, hence the name. The syntax is strict simply because it has to be computer readable. There’s no reading between the lines here, something is either 1, or 0. Also called the “Robots Exclusion Protocol”, the robots.txt file is the result of a consensus between early search engine spider developers. It’s not an official standard by any standards organization, but all major search engines do adhere to it. Search engines index the web by spidering pages. They follow links to go from site A to site B to site C and so on. Before a search engine spiders any page on a domain it hasn’t encountered before, it will open that domains robots.txt file. The robots.txt file tells the search engine which URLs on that site it’s allowed to index. A search engine will cache the robots.txt contents, but will usually refresh it multiple times a day. So changes will be reflected fairly quickly. The robots.txt file should always be at the root of your domain. So if your domain is www.example.com, it should be found at http://www.example.com/robots.txt. Do be aware: if your domain responds without www. too, make sure it has the same robots.txt file! The same is true for http and https. When a search engine wants to spider the URL http://example.com/test, it will grab http://example.com/robots.txt. When it wants to spider that same URL but over https, it will grab the robots.txt from your https site too, so https://example.com/robots.txt. It’s also very important that your robots.txt file is really called robots.txt. The name is case sensitive. Don’t make any mistakes in it or it will just not work. Each site has an “allowance” in how many pages a search engine spider will crawl on that site, SEOs call this the crawl budget. By blocking sections of your site from the search engine spider, you allow your crawl budget to be used for other sections. Especially on sites where a lot of SEO clean up has to be done, it can be very beneficial to first quickly block the search engines from crawling a few sections. One situation where crawl budget is specifically important is when your site uses a lot of query string parameters to filter and sort. Let’s say you have 10 different query parameters and with different values, that can be used in any combination. This leads to hundreds if not thousands of possible URLs. Blocking all query parameters from being crawled will help make sure the search engine only spiders your site’s main URLs and won’t go into the enormous trap that you’d otherwise create. Using the robots.txt file you can tell a spider where it cannot go on your site. You can not tell a search engine which URLs it cannot show in the search results. This means that not allowing a search engine to crawl a URL – called “blocking” it – does not mean that URL will not show up in the search results. If the search engine finds enough links to that URL, it will include it, it will just not know what’s on that page. If you want to reliably block a page from showing up in the search results, you need to use a meta robots noindex tag. That means the search engine has to be able to index that page and find the noindex tag, so the page should not be blocked by robots.txt. Because the search engine can’t crawl the page, it cannot distribute the link value for links to your blocked pages. If it could crawl, but not index the page, it could still spread the link value across the links it finds on the page. When a page is blocked with robots.txt, the link value is lost. We have a complete article on how to best setup your robots.txt for WordPress. 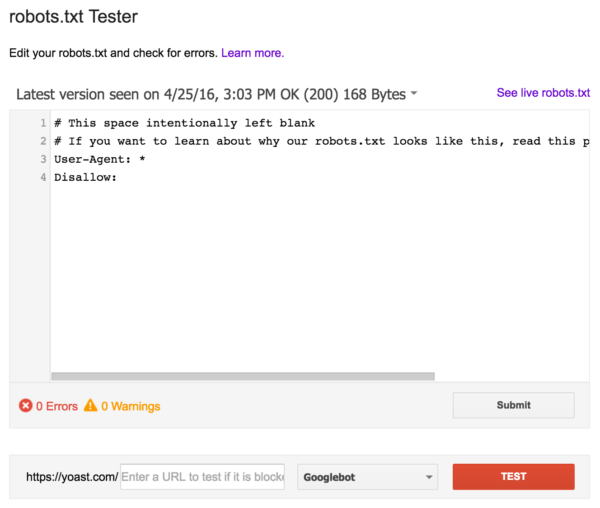 Note that you can edit your site’s robots.txt file in the Yoast SEO Tools → File editor section. A robots.txt file consists of one or more blocks of directives, each started by a user-agent line. The “user-agent” is the name of the specific spider it addresses. You can either have one block for all search engines, using a wildcard for the user-agent, or specific blocks for specific search engines. A search engine spider will always pick the most specific block that matches its name. Directives like Allow and Disallow should not be case sensitive, so whether you write them lowercase or capitalize them is up to you. The values are case sensitive however, /photo/ is not the same as /Photo/. We like to capitalize directives for the sake of readability in the file. A relatively simple User-agent: Googlebot line will do the trick if you want to tell this spider what to do. Note that most search engines have multiple spiders. They will use specific spiders for their normal index, for their ad programs, for images, for videos, etc. Search engines will always choose the most specific block of directives they can find. Say you have 3 sets of directives: one for *, one for Googlebot and one for Googlebot-News. If a bot comes by whose user-agent is Googlebot-Video, it would follow the Googlebot restrictions. A bot with the user-agent Googlebot-News would use the more specific Googlebot-News directives. The second line in any block of directives is the Disallow line. You can have one or more of these lines, specifying parts of the site the specified spider can’t access. An empty Disallow line means you’re not disallowing anything, so basically it means that spider can access all sections of your site. The example above would block all search engines that “listen” to robots.txt from crawling your site. The example above would, with only one character less, allow all search engines to crawl your entire site. The example above would block Google from crawling the Photo directory on your site and everything in it. This means all the subdirectories of the /Photo directory would also not be spidered. It would not block Google from crawling the photo directory, as these lines are case sensitive. In the example above, * is expanded to whatever filename it matches. Note that the rest of the line is still case sensitive, so the second line above will not block a file called /copyrighted-images/example.JPG from being crawled. This means /index.php could not be indexed, but /index.php?p=1 could be indexed. Of course, this is only useful in very specific circumstances and also pretty dangerous: it’s easy to unblock things you didn’t actually want to unblock. On top of the Disallow and User-agent directives there are a couple of other crawl directives you can use. These directives are not supported by all search engine crawlers so make sure you’re aware of their limitations. The only other way of achieving the same result without an allow directive would have been to specifically disallow every single file in the wp-admin folder. One of the lesser known directives, Google actually supports the noindex directive. We think this is a very dangerous thing. If you want to keep a page out of the search results, you usually have a good reason for that. Using a method of blocking that page that will only keep it out of Google, means you leave those pages open for other search engines. It could be very useful in a specific Googlebot user agent bit of your robots.txt though, if you’re working on improving your crawl budget. Note that noindex isn’t officially supported by Google, so while it works now, it might not at some point. Because only Yandex supports the host directive, we wouldn’t advise you to rely on it. Especially as it doesn’t allow you to define a scheme (http or https) either. A better solution that works for all search engines would be to 301 redirect the hostnames that you don’t want in the index to the version that you do want. In our case, we redirect www.yoast.com to yoast.com. Supported by Yahoo!, Bing and Yandex the crawl-delay directive can be very useful to slow down these three, sometimes fairly crawl-hungry, search engines. These search engines have slightly different ways of reading the directive, but the end result is basically the same. Do take care when using the crawl-delay directive. By setting a crawl delay of 10 seconds you’re only allowing these search engines to index 8,640 pages a day. This might seem plenty for a small site, but on large sites it isn’t all that much. On the other hand, if you get 0 to no traffic from these search engines, it’s a good way to save some bandwidth. Using the sitemap directive you can tell search engines – specifically Bing, Yandex and Google – the location of your XML sitemap. You can, of course, also submit your XML sitemaps to each search engine using their respective webmaster tools solutions. We, in fact, highly recommend that you do. Search engine’s webmaster tools programs will give you very valuable information about your site. If you don’t want to do that, adding a sitemap line to your robots.txt is a good quick option. Be sure to test your changes thoroughly before you put them live! You wouldn’t be the first to accidentally robots.txt-block your entire site into search engine oblivion.